Helicopter Mom, directed by Salomé Breziner (The Secret Lives of Dorks), is a new “comedy” that never takes off. 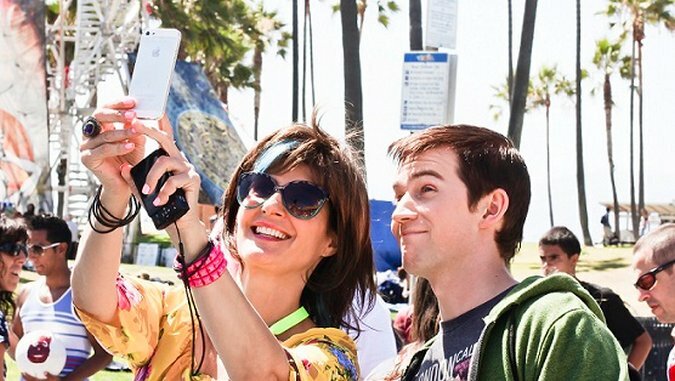 In fact, the film should stay grounded—permanently—because it wastes the talents of Nia Vardalos (My Big Fat Greek Wedding), Kate Flannery (The Office) and Lisa Loeb and insults the audience’s intelligence with lame attempts at humor and plot for most of its 81-minute running time. For those not familiar with the term, “helicopter” parents hover over and exceedingly control their children’s lives. The helicopter parent jumps in to do tasks that were once expected of the kids themselves, such as filling out job and college applications or challenging teachers on bad grades. However, Vardalos’ character, Maggie Cooper, is so over-the-top that she makes most other helicopter moms look like free-range parents. She may be well-intentioned, but in the end, she’s stifling, suffocating and probably mentally ill.
As played by Dolley—who looks older than 17—Lloyd acts unlike most teenagers. While embarrassed and annoyed at his mother’s antics, he’s far too patient and forgiving. She believes that he’s gay and “outs” him at school, sets him up with boys and files for a gay student scholarship on his behalf. The crux of the matter is that Lloyd’s still questioning his own sexuality; he’s not sure whether he’s straight, gay or bisexual. His mother makes the decision for him, not only because he has a good chance at the gay scholarship, but also because she simply doesn’t want another girl to come between them. Her fixation on him is borderline creepy; psychoanalytically speaking, it looks like Maggie has a Jocasta complex. Not familiar with it? Jocasta was Oedipus’ mom. In one particularly uncomfortable scene, Maggie is peeved that Lloyd has asked Carrie (Skyler Samuels, The DUFF), a girl, to prom and greets Carrie at the dance with, “You’re the girl who’s trying to steal my son away from me…” before offering her money to take a cab home (to not blow Lloyd’s gay cover). Right. Breziner’s disjointed film is rife with storylines that go nowhere and characters that briefly appear and disappear without explanation. Kate Flannery makes an appearance as a potential ally for Maggie against Carrie’s super-perfect PTA mom Barbara (Gillian Vigman), but the story goes nowhere and Flannery’s skills are wasted on lines like, “My son’s not gay. He doesn’t like pesto.” Lisa Loeb plays a teacher of Lloyd’s who encourages him to write, though she’s also written off into the background shortly after her introduction. Despite its numerous problems, there are three bright spots in the film. Helicopter Mom takes an original approach to teen sexuality. Lloyd is confused about his orientation—and that’s a refreshing take in the teen comedy world. In addition, two performers keep things from completely spiraling out of control. Samuels is appealing as Lloyd’s friend/potential girlfriend, who doesn’t pressure him into choosing a gay or straight label; and during the confrontation with Maggie at the prom, she shows off a cool maturity, too. Mark Boone Junior (Sons of Anarchy) stars as Lloyd’s aging rocker dad and Maggie’s ex-husband. Junior’s character serves as the voice of reason, keeping things grounded when Maggie goes off the rails. There could have been an interesting backstory on how the absentee father altered his family’s trajectory, but that storyline is also swept under the rug. To give them the benefit of the doubt, the filmmakers may have been aiming at social satire with Helicopter Mom, and just missed—badly. Instead of an absurdist comedy, Breziner’s pedestrian direction and Tran’s script omit the comedy and instead leave us with the absurd.